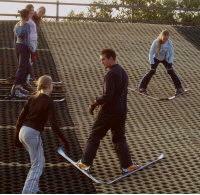 The aim of these one off sessions are to develop the basic skills to progress on to parallel skiing. If you have just completed 1 week on snow, or a beginners course then an improver session is ideal for you. Here at the Suffolk Leisure Park we understand the need to get the job done. For this we offer a learn in a day course for skiing and snowboarding. The courses are 6 hours in length with breaks spread over the day. For people aged 14 and upwards. Must be fit enough to cope with the strenuous tasks. Please contact us on 01473 602 347 for availability. 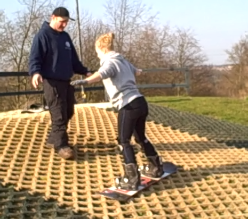 Want to learn to Snowboard before your holiday or just looking to try a new exciting sport then our Snowboard Courses are a great place to start! Lessons are 3 x two hours over a 3 week period and gives you the basics to reach a safe standard (control of speed and direction) and learn to use a button lift. Group size is a maximum of 8. All equipment including Snowboard, Boots, and Pads are included. Please note snowboarding is a physically demanding and requires a reasonable level of fitness. If you have a group of kids, a hen party, stag party, or just a few friends that fancy giving skiing or snowboarding a go, and there is not a date that suits you……just give us a call!!! We will try and set up something up that works for you! Ski Lessons for complete beginners or those who have not skied for a long time and wish to go through the basics again and build some confidence. Lessons are 3 x two hours over a 3 week period and gives you the basics to reach a safe standard (control of speed and direction) and teach you to use a rope tow and/or button lift. Group size is a maximum of 12. If you’re not quite sure if skiing or snowboarding is the sport for you, or you just fancy trying something new….a taster is a great way to dip your toe in the water before committing to a course or heading out to the alps! Taster sessions include a brief introduction to the equipment before heading out to the nursery slope to try your skills at some of the basics. Tasters are run in groups of up to twelve people, so you can have fun and learn with others at a nice easy pace. Includes 15% discount voucher for use on a course or private lesson - should you get the bug and want to come back for more!